Purdue University Press, 9781557536402, 496pp. This is the true story of a young boy from Posey County, Indiana, who had a dream to fly. The outbreak of World War II enabled him to fulfill that dream. Cheerio and Best Wishes is told entirely through the letters he wrote to his family and friends. Detailed narrative and commentary provide explanation and background information.One hundred thirty-eight letters are presented in this book. It is highly unusual to find this many letters from one person, curated by his family and recently rediscovered by his son, along with carefully created photograph albums. The story starts in rural southern Indiana and follows the young volunteer as he goes westward to California and New Mexico to be trained to fly bombers. From the United States, he travels via South America and North Africa to England and deploys with the Eighth Air Force. The accounts of his journeys and experiences are detailed, ranging from entertaining to spine-tingling. Moments of high drama intermingle with the mundane nature of war.Together the letters and pictures in this book (the originals are now preserved for posterity in the Purdue University Flight Archives) offer a comprehensive and cohesive story of how US airmen were prepared and trained for war, and detail the daily experience of a bomber pilot flying missions over Germany. The letters of one young flyer reflect the experience of thousands of Americans who volunteered to go to war in the 1940s. His experiences were those of a generation. In 1941, Ralph H. Schneck was a young man working for a grocery distributor in Evansville, Indiana. When the world erupted in war, it threw Ralph and thousands like him into military service. Ralph excelled in every aspect of his training, becoming a respected lead pilot in the Eighth Air Force. After a short period of civilian life, he was recalled to active duty and served in the US Air Force for twenty-five years before retiring.Don R. Schneck was born during his father's short civilian career and raised on Air Force bases until he graduated from college. He worked in business and industry for over forty years, living in the Midwest and Eastern United States. After writing marketing and promotional material for most of his career, he also has turned to writing in his retirement. 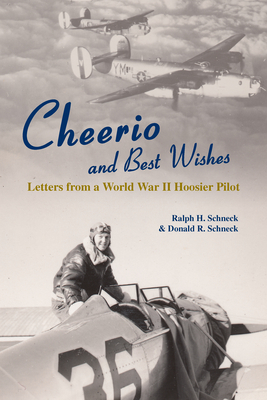 Cheerio and Best Wishes is his first nonfiction work.